People think weddings are all about the bride, but we have a very different perspective. The modern man has every right to interject his own personal style in the wedding just as much as the bride. There is so much emphasis placed on the wedding gown, that the groom's attire can sometimes get lost in the hoopla. That is, until now. Menswear is making a splash on the runways all over the world and we've found some incredibly hot designs to keep your groom looking like he just stepped out of GQ. 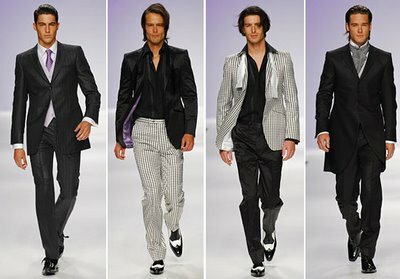 Check out the 2009 bridal menswear collection from Spanish designer Fuentecapala. Can you picture your groom in one of these amazing tuxedos? Check out the wide variety of styles, colors, and designs. We're seeing alot of texture in the fabric choices and thin straight leg pants. You'll also notice splashes of color in places like the lining of coat. For those of you like like the traditional tails and coats, you'll notice more options for your groom and even combination styles that mix the traditional tuxedo with an ascot tie. So which one is your favorite tuxedo?